Mrs. WPF is a vegetarian, so we start most meals with a great big salad. But when summer comes, I like to switch out colds salads for warm grilled veggies. This is my master recipe. It works for any type of vegetable. 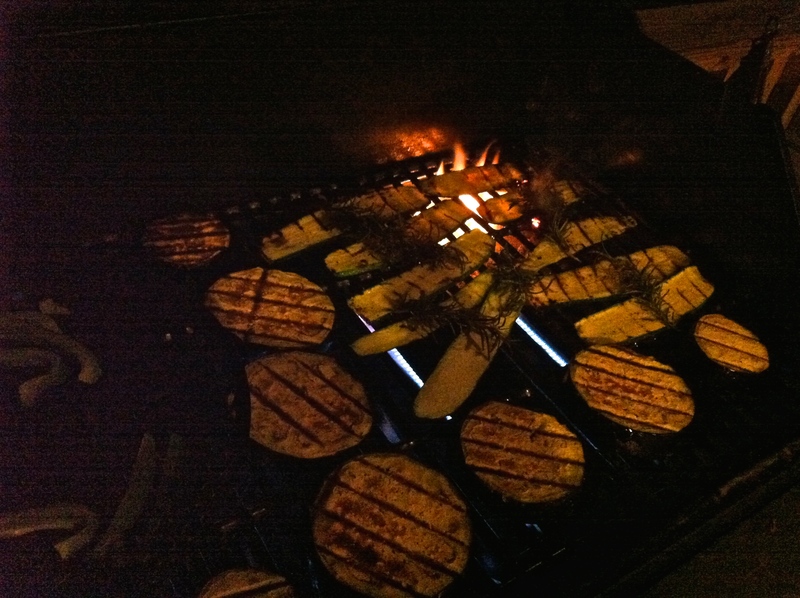 Good grilling veggies are those that have a firmer texture. I often make these with mixed veggies: zucchini, summer squash, peppers, eggplant, tomatoes, onions, asparagus, mushrooms, whatever is in the garden or down at the farmer’s market, and it always turns out wonderfully. The basic idea is to slice your veggies into appropriate shapes (see below), then season them in a pan or a bowl with olive oil, fresh herbs, and salt and pepper, and then grill them over hot coals or gas flames. It takes about 10 minutes to cut and season and about 15 minutes to grill. These are fabulous hot and straight off the grill, and are terrific as a cold salad. I often take them with lunch the next day. Slice your vegetables to a size that won’t fall through your grill grates. Keep in mind that grilled vegetables will shrink a bit and will definitely soften. For eggplant, I like a half-inch cross cut, or a quarter inch lengthwise cut. For tomatoes, I cut them in half. With asparagus, just snap up from the bottom to where they easily break. 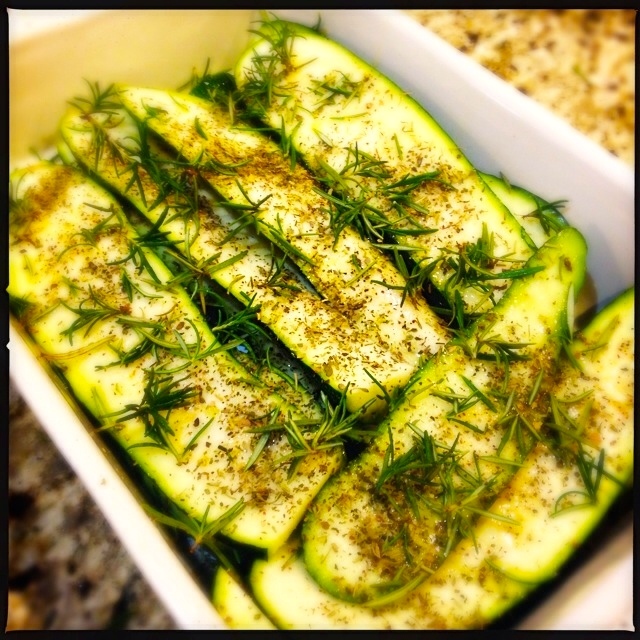 Zucchini and summer squash? Lengthwise. Peppers? I like strips. With onions, I like thick slices, about a third to half an inch thick. If you are using long vegetables, you will want to use a 9×13 pan to season them. If you are using smaller-sized vegetables, a large bowl is fine. You’ll want to get some seasoning down in the bowl, so that the vegetables end up seasoned all around. 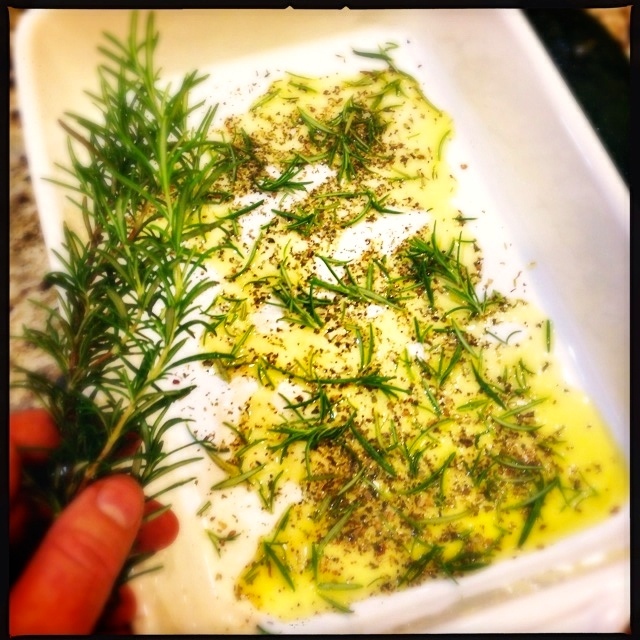 Pour a few glugs of oil into the pan or bowl (canola oil or olive oil work well) and add some salt and pepper and some herbs. Here’s my herb garden. 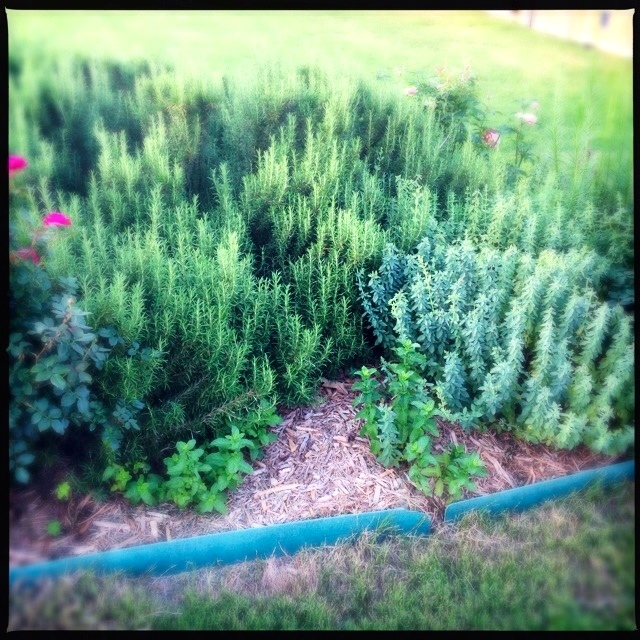 I grow rosemary, oregano, thyme, mint, basil and cilantro. Add one layer of your vegetables to the pan, then add some more oil, and more herbs. Season each layer with salt and pepper. 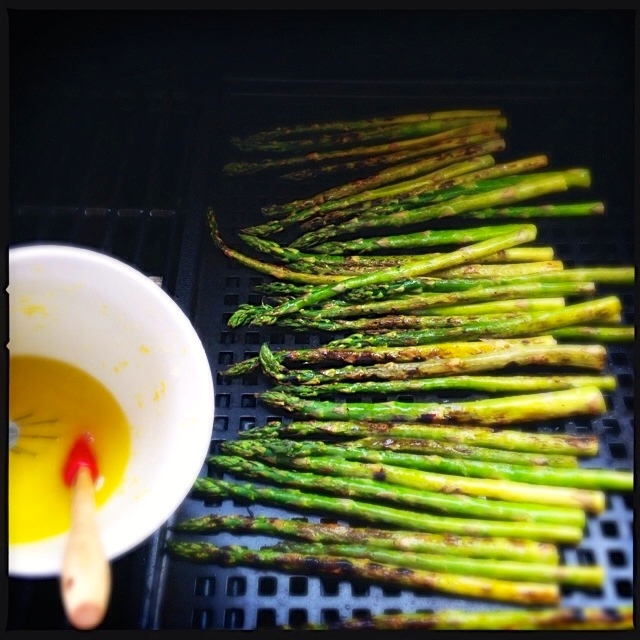 Once you have finished seasoning all of your vegetables, it’s time to hit the grill. You have a couple of options. You can grill your veggies right on the grill grates, or you can use a grill pan (like a cookie sheet or a sauté pan with holes in the bottom). I like to use the grill grates for long vegetables, and a grill pan for onions, peppers and tomatoes. It’s easier to keep them together. Before you light the grill, make sure that your grill grates are clean. I like to scrape them with a good grill brush. (You want things nice and clean so that bits of whatever was there before don’t catch on fire this time.) Light your grill and get it nice and hot. If you are using a gas grill, you can go ahead and light all of your burners. If you are using charcoal, try to leave a portion of your grill without any charcoal. You’ll want that cool spot later. Using tongs, lay your veggies on the grates. You want to keep the heat hot, but don’t want to your veggies to burn. Keep them still on the grill for about 5 minutes or so. You want them to stay in one place so that you get nice brown grill marks on them. After about 5 minutes on the grill, use your tongs to peek under one of the veggies and see if you have marks. If you do, flip them over to the other side. Grills have hot spots. If you see that some of the veggies have burned, move them to a part of the grill where things aren’t so hot, or turn your grill down. Grill your veggies on both sides, then pull them off and set them in a serving tray. I like to dress them again with a bit of salt and pepper, and sometimes with a little olive oil, but that’s really up to you. Enjoy. Slice your vegetables to a size that won't fall through your grill grates. Keep in mind that grilled vegetables will shrink a bit and will definitely soften. For eggplant, I like a half-inch cross cut, or a quarter inch lengthwise cut. For tomatoes, I cut them in half. With asparagus, just snap up from the bottom to where they easily break. 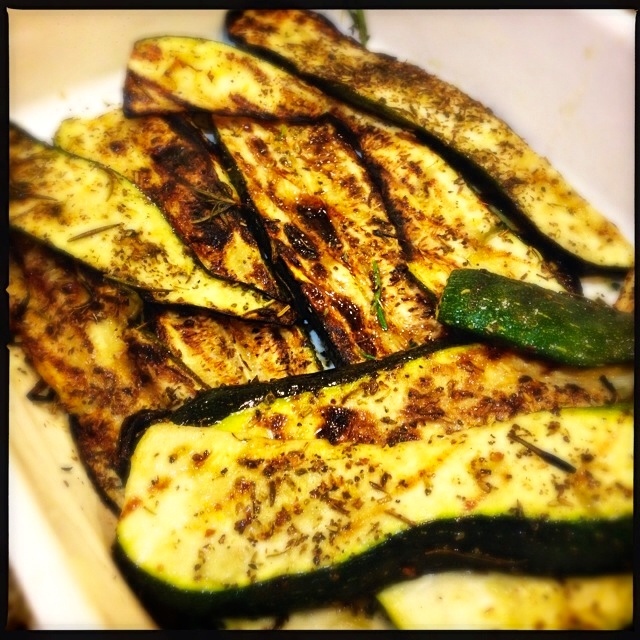 Zucchini and summer squash? Lengthwise. Peppers? I like strips. With onions, I like thick slices, about a third to half an inch thick. 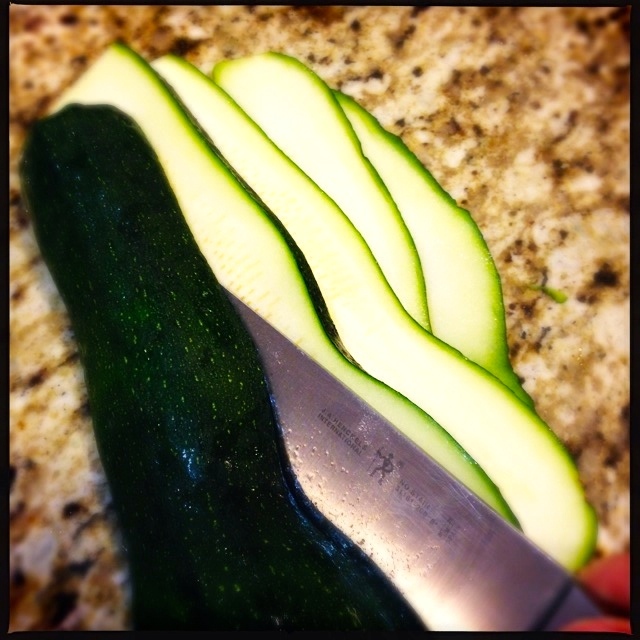 If you are using long vegetables, you will want to use a 9x13 pan to season them. If you are using smaller-sized vegetables, a large bowl is fine. You'll want to get some seasoning down in the bowl, so that the vegetables end up seasoned all around. Pour a few glugs of oil into the pan or bowl and add some salt and pepper and some herbs. You can use fresh or dried herbs. The best kind for this is a mix of Italian herbs or Italian seasoning. Those mixes generally contain oregano, rosemary, thyme, basil, and the like. Using tongs, lay your veggies on the grates. You want to keep the heat hot, but don’t want to your veggies to burn. Keep them still on the grill for about 5 minutes or so. You want them to stay in one place so that you get nice brown grill marks on them. After about 5 minutes, use your tongs to peek under one of the veggies and see if you have marks. If you do, flip them over to the other side. Grill your veggies on both sides, then pull them off and set them in a serving tray. I like to dress them again with a bit of salt and pepper, but that’s really up to you. Enjoy.